The game of World War Two combat. GAME RULES: The complete gaming rules covering movement, weapons, close quarters combat, artillery and more. Includes opportunity fire, hidden troops, snipers, tank support and fortifications. 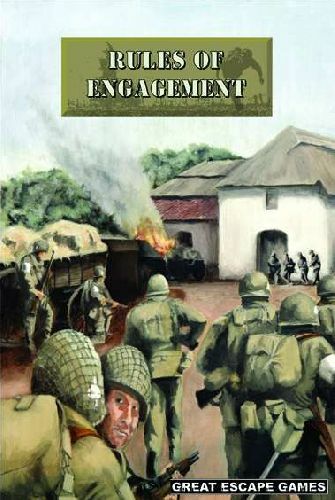 With clear examples and diagrams, Rules of Engagement is easily accessible yet offers plenty of depth for experienced players. SCENARIOS: Nine scenarios from take and hold missions to desperate rearguard actions. Each scenario includes specific rules covering, for example, rserves, unacceptable losses and additional orders. THE SECOND WORLD WAR 1944-45: A detailed history of the War on the Western Front from D-Day to the Fall of the Reich. The Orders of Battle section gives detailed listings of the forces available including company and divisional support options. Forces covered: German Grenadiers, Panzergrenadiers, Volksgrenadiers, Fallschirmjager and Waffen SS, British Infantry, Airborne and Commandos, Canadian Infantry, US Infantry, Armored Infantry, Parachute Infantry and Rangers and the Maquis. HOBBY SECTION: A complete colour guide to painting your miniatures and creating a battlefield. Uniform and equipment guides for all the forces featured in the Orders of Battle including British and Canadian Infantry, British Airborne and Commandos, German Grenadiers and Panzergrenadiers, Fallschirmjager, Waffen SS and Volksgrenadiers, US Infantry, US Airborne and Maquis.